Carrying a weapon in North Carolina has become increasingly complex. If you want to avoid criminal charges, it makes sense to talk to NC Gun Rights Lawyer John Fanney. If you’re dealing with a 50B Order, allegations of domestic violence, or other CCW Gun charge in Raleigh or the judicial districts surrounding Wake County, we’re here to help. Who can own a Gun in North Carolina? There have been a host of news reports about significant gun control laws throughout the United States. They are being called Red Flag Laws. During what is most often an Ex Parte hearing, a Judge may Order the removal of weapons (including firearms) from a person who may be a danger to themselves or someone else, including the general public. Depending on the particular jurisdiction, it may require a Petition to the Court. After a hearing on the issues involved, the Judge may consider the statements and actions of the gun owner, relative to the alleged danger they present to the community and/or themselves. 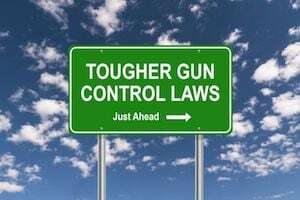 Under the NC gun laws, you are not allowed to possess a firearm if you have a felony on your record, or have been found not guilty by reason of insanity, or there is valid Order against you pursuant to N.C.G.S. Chapter 50B – Domestic Violence Protection Order. If you’re uncertain whether you may carry, own, or purchase a firearm in NC, talk to an attorney before attempting to do so. There can be serious, long-term consequences to violating one of the many gun laws in the Pine State. Does North Carolina have a Red Flag Law? Strictly speaking no; but, there are several other laws that are very similar in both cause and effect. Indeed, there is a legal process by which a 50B DVPO (a type of Restraining Order due to Domestic Violence) may result in a Court Order directing the Sheriff to come to your house and take your guns. Much like the Red Flag Laws in other states, the Motion and Order to Domestic Violence Protection Order is filed Ex Parte. That means a Order may be issued without formal notice or your presence in court, directing the removal of firearms. That is not to say the Order lasts forever and/or that you do not have substantial Due Process rights to a hearing. 50B Orders start as a Temporary Order and require by formal Service of Process and a formal hearing on the merits at a later date. What are the Red Flag Laws Called? A lot depends on the state you’re in. For example, in states like Washington, Vermont, Oregon, and Maryland, it’s called an Extreme Risk Protection Order. Florida refers to its Red Flag Law as a Risk Protection Order and Connecticut calls it a Risk Warrant. In Indiana, lawmakers established Proceedings for the Seizure and Retention of a Firearm. And in California they call it a GVRO or Gun Violence Restraining Order. 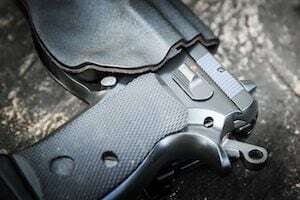 Can I Carry a Concealed Weapon in North Carolina? This is where it can get a bit complicated. If you’re on your own property, generally speaking you may carry concealed without a permit. Obviously, there are certain restrictions, such as if you are a convicted felon or are subject to a binding 50B Order. Otherwise, in order to carry concealed, you must have Concealed Carry Permit in North Carolina. Such permits apply only to guns. It’s still illegal to carry concealed a knife or other weapon, even with a valid permit. What are the Requirements for a Conceal Carry Permit in NC? This too can be a complicated area of the law. That’s because the NC General Assembly gives a certain amount of discretion to the elected Sheriff in each of the 100 counties in North Carolina in determining whether a CCW permit should be issued. If you have legal questions about the NC gun laws, give John Fanney a call. He offers a free consultation for criminal matters and other gun rights legal issues. Mr. Fanney is available legal commentary on Red Flag Laws.